The Jazz has been revised for 2012 with the introduced of the hybrid model and the return of CVT automatic transmission to replace the divisive i-SHIFT transmission. CVT - offered on the previous GD Jazz from 2002 to 2008 - will be welcomed back by owners frustrated with the I-SHIFT transmission offered since launch of the GE Jazz in 2008. Judging by the comments made in our forums about I-SHIFT, we doubt it will be missed; and we can't help but wonder if the comments made on this site have been noted by Honda. But there is some bad news; the cheapest hybrid is a fiver short of £16,000 and is barely cheaper than the entry-level Insight. Worse still, the Jazz hybrid can't match the Insight's 101 g/km CO2 emissions. In a sector where diesels make little sense due to the price differential over petrol, we wonder if the main beneficiaries of the hybrid will be the environmental aware rather than those looking for overall lower motoring bills. And perhaps the worst news is that yet again Honda has passed up the opportunity to offer UK buyers' the 1.5-litre i-VTEC engine as offered in South African Jazz's rolling off the same Swindon production line. Maybe next time Honda? 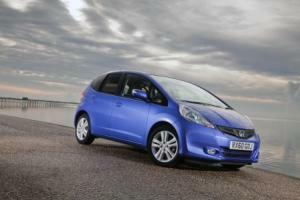 The popular Honda Jazz has been given a refresh, with a range of enhancements to both looks and driving dynamics. The revised Jazz range, which will include a hybrid model, goes on sale in the UK on 1 February 2011, with prices starting from £11,295 for the 1.2 S model and £15,995 for the Hybrid variant in HE trim. The challenge for Honda’s engineers was to freshen and improve the car without compromising on the characteristics that make the Jazz so popular. But by enhancing the car’s strongest qualities, Honda has taken the Jazz on to the next stage, producing a car with greater flexibility, better looks, increased ride comfort and improved eco credentials. While the revised car is just as cleverly packaged, fresh styling gives the Jazz a new appearance. New front and rear bumpers are the main parts to have influenced the look of the car. These have also been designed to reduce drag as the airflow passes over the Jazz’s body and to avoid turbulence when the airflow detaches from the rear. These styling improvements aid aerodynamic efficiency on all Jazz models helping the Cd figure to fall from 0.336 to 0.330. Constantly variable transmission, more commonly known as ‘CVT’, first appeared in the previous Jazz range and due to overwhelming customer demand Honda has brought it back along with a few clever improvements. The CVT is an automatic transmission that keeps the engine in a rev range where the car is most efficient. As well as ensuring the whole power train of the Jazz is more efficient, it also offers the driver a smooth and effortless journey. The CVT transmission is a standard feature on the Hybrid while it is available as an option on 1.4 litre petrol models, where, thanks to the improvements, it now matches the economy and emissions of the outgoing Jazz i-SHIFT, with a CO2 value starting at just 125g/km. Leather upholstery makes a very welcome appearance for the first time in the Jazz range. Along with the addition of chrome rings defining the air vents, instruments and climate controls across the dashboard, the leather trim gives a whole new premium feeling to the interior of the car and is an important option for customers downsizing from larger vehicles from other sectors. Leather seats are standard on the Jazz Hybrid in HX trim and available as a £1,250 option on the 1.4-litre petrol EX model. Another change across the range is a new darker dashboard material which contrasts strongly with the orange and blue back lighting of the dials, gauges and displays across the dashboard. The orange backlighting colour is unique to the petrol powered variants, while the Hybrid version uses the blue lighting to differentiate the model from the rest of the range. The Magic Seats, famed for their flexibility and multiple seating and cargo-carrying configurations – are now even better with the addition of a reclining rear seat. The rear seats can now recline 73mms to increase rear passenger comfort. The established 1.2-litre and best-selling 1.4-litre i-VTEC petrol engines remain in the Jazz range and to compliment the launch of the Hybrid variant, these two petrol engines have benefited from some small reductions in CO2 values and improved fuel economy. The 1.4-litre manual variant with manual transmission has emissions starting at 126 g/km down from 128 g/km and uses 51.4mpg on the combined cycle. The fuel sipping 1.2 litre engine uses 53.3mpg and also drops two grams of CO2 to 123g/km. The Jazz Hybrid is an ultra-efficient car with a combined fuel consumption figure of 62.8 mpg – and with the same super-smooth electric system as the Insight, even more fuel is saved around town. While a CO2 output of just 104g/km makes the Jazz Hybrid the lowest of any automatic car in the B-segment. The suspension on the 2011 Jazz features revised settings to increase ride comfort and improve handling. Already well respected for its lightness and manoeuvrability around town, the Jazz benefits from improvements to steering feel at higher speeds. Thanks to this continuous improvement the revised model has a much firmer, positive steering feel as speeds increase to inspire a confident driving experience. All Jazz models, including the Hybrid version, share new sleek, projector style headlights adding to the sportier look. There are four new colours available across the petrol range – Azure Blue, Polished Metal, Urban Titanium and Ionized Bronze. The Hybrid version also benefits from Azure Blue plus two new colours – a vibrant Lime Green Metallic and Taffeta White. * Integrated satellite navigation with Traffic Message Channel and Bluetooth hands-free phone system. * USB port in place of AUX-in. Metallic or pearlescent paint +£440. T-Grade models available as per non-hybrid Jazz. Now we know why the 2008 GE has the silly flaps on the parcel shelf - they are to allow the rear seats to recline in the 2011 model! CVT is back, good, however, too late for me, nice new Golf sitting on the drive. Even after the rumours started about the possible return of CVT the dealers were (up until very recently) insisting that it wasn't true and that Honda were commited to the dreadful i-shift, as such I went ahead and spent my £22k on a nice Golf. I don't think I'll return to the Honda brand as they and their dealers are far too far up themselves, if you get my drift. Berisford: did you get a manual or DSG Golf? And if it's DSG, how does it compare with I-SHIFT? I've heard some applications of DSG in VAG cars suffer from the same problems as I-SHIFT, namely changing up too early in the name of headline MPG and CO2 figures. Richard, I bought the 7 speed DSG with a 1.6 diesel and yes, after a period of 'pottering' it can be a bit eager to change up on light throttle but it happily changes back down again when required. However, give it a bit of poke and the box 'learns' quite quickly to hang on a bit. The gear changes though are only seen (on the dash) and not felt as on the i-shift. Despite what I said in my other post I'll be one of the first in the queue to test drive the new CVT Jazz, just to see what could have been! Will Honda ever get this right? /\ I do wonder how difficult it must be to tune the ride and handling to suit out roads! Ford seemed to get it spot on with the Fiesta while Honda fiddled with the GD's suspension settings at least twice during its lifespan! Is it jazz 1.4 CVT anymore like they have rumoured months ago ? Still worth a test drive of the new model in Feb, but the competition is much improved since the 1st Jazz . Hurrah. But I would rather have the GD parcel shelf back than reclining rear seats. I think the current GE interior is rubbish. The new Jazz range goes on sale in February with prices starting at £11,295 for the 1.2. The 1.4 CVT will sell at £14,495 and the Hybrid weighs in £1,500 more at £15,995. This is around £600 more than a Polo Blue Motion 1.2 TDI, and over £1,200 more than a Mazda 2 diesel. Or choose yourself the Hyundai i20 1.4CDI Comfort and you could pocket nearly £4,000 in spare cash. Honda are in danger pricing themselves out of the small car market. Lower sales and more dealer closures. I don't think my Jazz 1.4Si was worth its list price. Without the incentives of a reasonable trade in on my old Jazz, a £1000 discount on the new plus 0% finance and 3 year complimentary servicing with road tax I wouldn't have bought especially as Honda cheapened the interior of the GE model. Hopefully they will have rectified the poor cabin materials with the 2011 model but it's still too expensive for my liking. After 8 years of being a happy Honda owner I think I will be looking elsewhere for my next car. A gripe of mine the Insight has just been reduced by £1k by Honda to £14995.00 so how does this segment now compare with the Jazz Hybrid at £15995.00. Come on Honda get the pencil sharpener out and make the Jazz more competitive.